Discover the Universe – both Large and Small! Use the telescope to look at birds and wildlife at a distance or to view the craters of the moon! Use the microscope to view microbiological specimens at high power magnification! 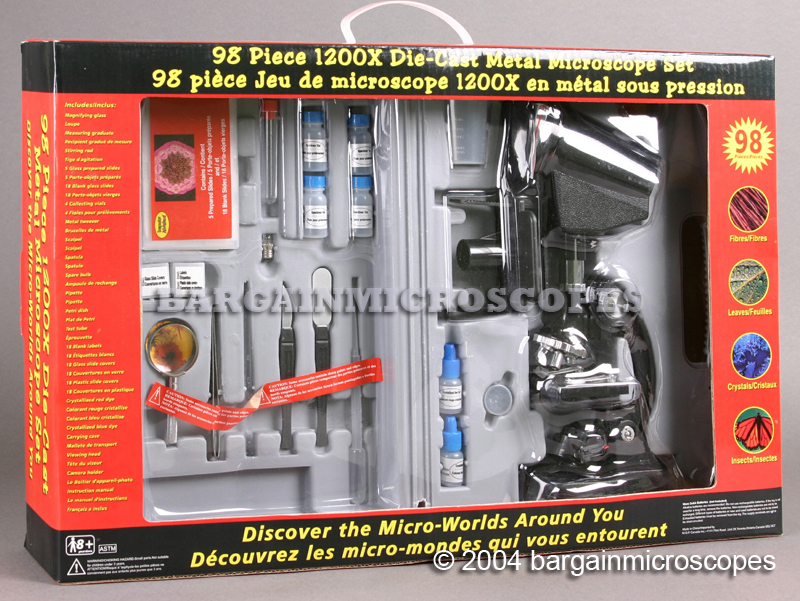 Excellent microscope kit for the beginning scientist! Great educational tool for sparking a lifetime of learning and interest in astronomy and microbiology. Give a child a microscope and you give them a view to the world beyond their eyes! 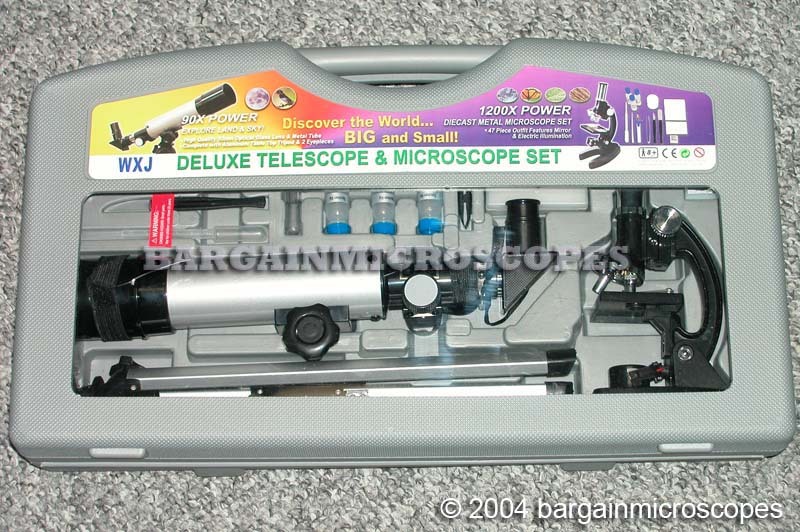 This set includes a microscope and telescope both, with a handy microscope accessories kit! Includes molded plastic carrying and storage case great for portability! Includes everything needed to make your own biological specimens on slides! Set of plastic blank microscope slides. Eight glass slide microscope cover slips, square size 18mm x 18mm. Eight plastic slide microscope cover slips, round size 15mm x 15mm. Set of prepared microscope slides, professionally prepared and stained with biological specimens for ease of viewing the microscopic image. Two pond water specimen collection canisters. One spare microscope bulb, 2.2V, 0.25A. Includes instructions for the microscope. All included in one molded plastic microscope carrying and storage case. Three magnifications available: 300x, 600x, 1200x. Microscope frame made from die-cast metal. Microscope stage with microscope slide clips. Focusing knobs on both sides of microscope to raise and lower the microscope head to get the specimen into focus. Microscope objectives mounted on revolving turret for easy selectability of magnification. Power: Uses two AA batteries (not included), located in the base of the microscope. Capability for solar lighting using the included mirror on the bottom light source.